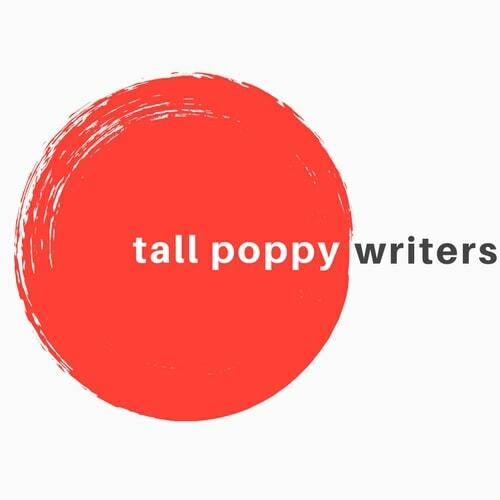 Please help me give a warm Poppy welcome to debut author Sandi Ward. 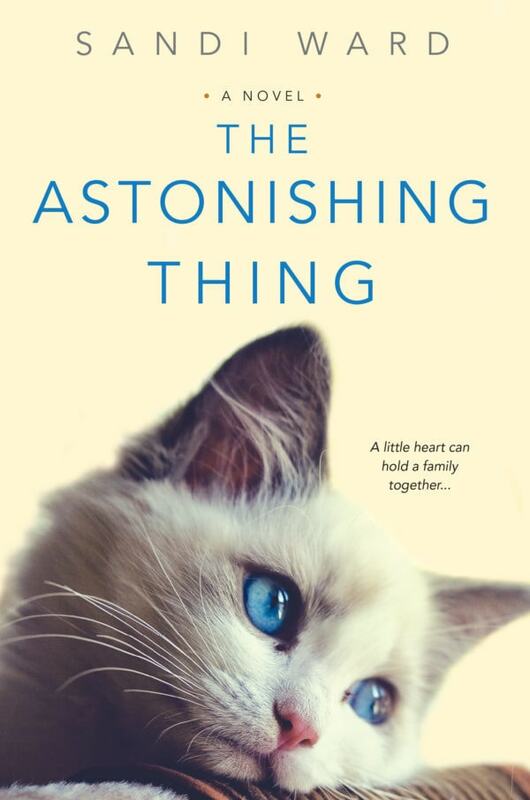 Her fabulous book, THE ASTONISHING THING, releases next week and seriously, look at that cover!! I’m looking forward to launching The Astonishing Thing into the world, but I’m also excited about the fact that my release day is Halloween! It’s a big day in our family. We have just as many decorations for Halloween as we do for Christmas. When my daughter was in middle school, she threw an annual Halloween party where kids would stop by after trick-or-treating for a hot dinner of mac-n-cheese and lasagna—followed by more candy, of course. I always dressed up as the Wicked Witch of the West. Now that my kids are older, we take it easy, but still have fun. Last week we made cupcakes decorated like little monsters. There are many places I love to be! But foremost on my mind right now: at a theater, settling into my seat while the lights are dimming, excited for a fantastic show to begin. My husband just got tickets for us to see Harry Potter and the Cursed Child on Broadway in July 2018. I can’t wait! As a fellow cat person, I love the idea that you wrote this book from the point of view of a cat. Tell us a bit about what made you decide to take that route and what challenges/push-back you came across. This is Winnie, Sandi’s cat, who is obviously waiting for her royalty snacks. Hello, fellow cat person! There are many of us out there. I’m always happy to meet another cat person. 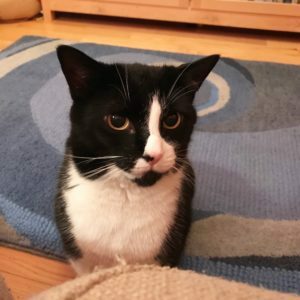 The Curious Incident of the Dog in the Nighttime by Mark Haddon is a story narrated by an autistic teenager, and that novel inspired me to try using my own unconventional narrator—in this case, Boo the cat. It was fun to write from Boo’s point of view. She’s very loving, but also sassy and sarcastic. I think that’s how many people think of their cats: sweet but judgmental. She understands most of what’s going on around her, but not all of it. I suspect readers will figure a few things out before Boo does. The hard part was making sure Boo was an active participant in her family’s story. She’s just a cat, and the humans are creating most of the drama. But she couldn’t just sit and watch; she needed to be part of the story too! So she impacts events in little ways, wherever she can. What’s one thing you’ve learned about yourself during this exciting/stressful/amazing/crazed debut period? I guess I already knew this, but I’m pretty good at multitasking. There are a lot of moving parts to a book launch! Yet I’ve managed to stay fairly organized…so far, anyway. Ask me again in three months. I’m reading The Boat Runner by Devin Murphy. It’s very exciting—full of more action than any book I’ve read this year. The subject matter is dark, to be sure, because the story is about the destruction and devastation caused by World War II and the ways families were torn apart. But I’m holding out hope that our hero Jacob escapes with his life and hopefully most of his sanity. 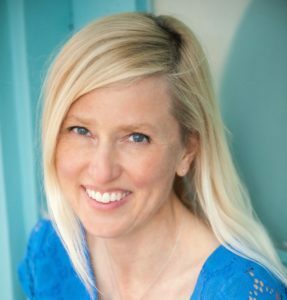 Her first novel for Kensington Books is titled THE ASTONISHING THING, and it launches October 31, 2017. Her second novel is titled SOMETHING WORTH SAVING, available November 2018. This sounds like a fun book. I’m a cat person too! Sandi! I’m can’t wait to start reading your book the moment it arrives!